This last weekend I had the pleasure of celebrating a friends 40th birthday. At his party, his mom, Becky made these delicious stuffed jalapeno poppers. These were simple and elegant, and so delicious. I never thought of putting together goat cheese and pickled jalapeno peppers together, but now that I have tried this, this dish will be making future appearances at my house. If you have never tried pickled jalapeno peppers, I highly recommend them. They aren’t generally too spicy and sometimes they come packed with onions and carrots that you can use in other ways. Many local Mexican restaurants in Houston will serve you a dish of the pickled jalapeno peppers when you have dinner. 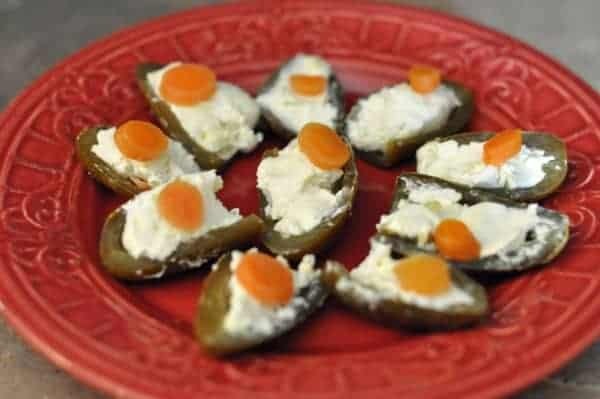 I have used these in other recipes, but mostly I am stuffing the pickled jalapeno poppers with cream cheese, but let me tell you, the often stronger taste of goat cheese is sublime with the pickled jalapeno peppers. Goat cheese goes so well with pickled jalapenos. I make a very similar dish, but I use raw jalapenos, stuff with goat cheese and then throw them in the smoke for an hour. The smoking adds flavor and mellows out the peppers. Delish! I want to try smoking them too! What type of wood do you use when you smoke these? Personally I’ve never liked jalapeno peppers in any form; the flavor just doesn’t sit right with me. Serranos, though smaller, work well with this recipe, though; the flavor is better and they’re only slightly hotter than jalapenos. What is the orange item on top in the pictures? You know, I haven’t really had many pickled jalapeños, but this makes me want to go out and get some. I love goat cheese!